Koh Kret is an island in the Chao Phraya River, 20 km north of Bangkok in Nonthaburi Province, dating back to 1722 when a canal was dug as a shortcut to bypass a bend in the Chao Phraya river. 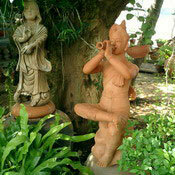 The island continues to serve as a refuge to the Mon tribes who settled here in the 6th Century. Koh Kret is another world compared to Bangkok and much of it retains the air of a rustic village, with wooden shacks propped against palm trees and the occasional dilapidated temple slowly crumbling. 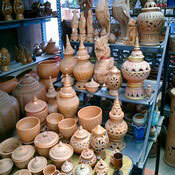 Hence the main attraction is just walking around, browsing the merchandise in the many pottery shops. The island is roughly square in shape, each side measuring about 2 km, and a path runs around the entire island. The walk at a pleasant pace takes an hour and a half or two hours. The Mon people have retained their unique flavor of Buddhism and Wat Poramai Yikawat is the main temple on the island. 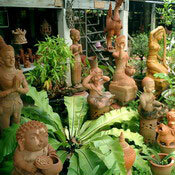 Koh Kret is renowned as a center for Kwan Arman style of Mon pottery, which is just baked unglazed red clay carved with intricate patterns. 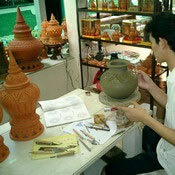 This is regarded as the most beautiful of all unglazed pottery available in Thailand. 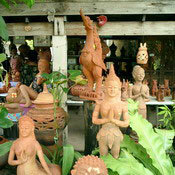 There are about twenty pottery workshops on the island. Thai and Mon snacks and desserts are plentiful, making your stroll that much more enjoyable.